“Freely inspired” by Little Red Riding Hood by Charles Perrault, The Little Red Wolf takes its dark source material to the next level. It is beautifully designed with complex, full-color woodland scenes and ominous, murky depictions of humanity. 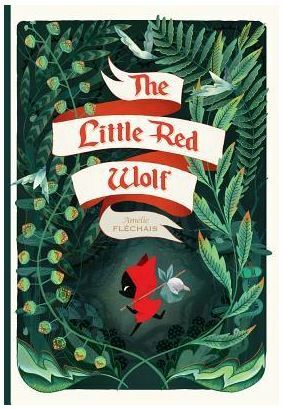 A young wolf in a red cape takes the place of Little Red and his mother tells him to be wary of two humans, a hunter and his daughter. After the little wolf wanders from the wooded path on the way to his grandmother’s, we learn that perspective and memory can blur the line between victim and villain. 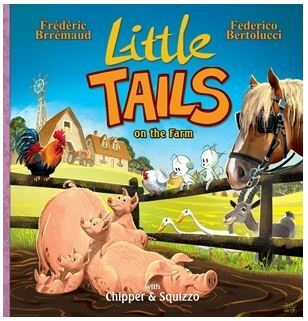 Originally published in 2014 under the title, Le petit loup rouge. Verdict: This story has some heavy content. I wouldn’t recommend it for reading aloud in a classroom because children have different thresholds for fear. I would recommend it to public and school libraries. The latest in this series leaves more exotic locations such as the forest, jungle, savannah, and prehistory to explore a farm. As in the earlier fun educational journeys, Chipper the puppy and Squizzo the chipmunk are depicted in cartoon strip antics above brightly colored realistic artwork showing the animals in the designated setting. The focus of the story is a search for milk, leading them to meet a variety of animals before a party and a ride home on a foal. Verdict: The humor is light, and the characters cute. The animals featured include more exotic ones such as a peacock and ram, and fun facts about animals are provided at the end. April/May 2018 review by Nel Ward.